Back to: Swords, Knives, Hangers and Daggers. 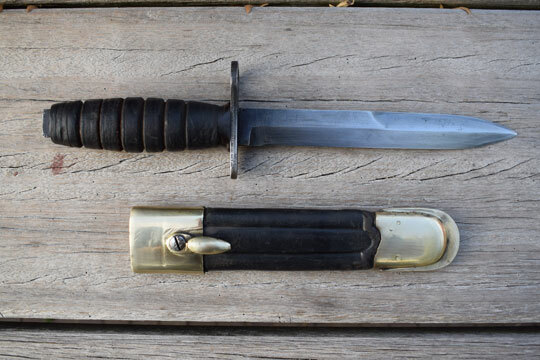 US M4 bayonet converted to a fighting knife. Very good parkerized single edged blade with a large false edged. Excellent 6 groove leather grip and pommel with bayonet slot removed. Excellent parkerized crossguard with muzzle ring, MRD 14.75 mm. Crossguard is crisp marked US M4 - Flaming bomb - IMPERIAL . This fighting knife comes as found in an excellent Italian shortened M 1871 black leather scabbard with brass fittings. No dents to the fittings and all stitches intact. 100% WWII (1943-44) produced bayonet, flaming bomb marked. Very interesting WWII set! Never encountered before.